In his book entitled “Hurricane of Fire,” Historian Charles Robinson provides a sound and detailed description of both the history and importance of Fort Fisher to the Confederate war effort. According to Robinson, by mid 1864 the South’s major Atlantic ports had be reduced to the ports in Wilmington, NC and Charleston, SC. Fort Fisher, charged with guarding the mouth of the Cape Fear River and by extension the port at Wilmington, was thus an essential Confederate stronghold. In “Hurricane of Fire,” Robinson details the geographical and logistical reasons that made the port of Wilmington a safe haven for blockade runners and a vital supply hub for the Confederate armies. Robinson provides significant detail on the fortification of Fort Fisher by Colonel William Lamb, a career soldier who turned an old, rundown battery into “the South’s greatest fortification” (Robinson 31). In addition to detailing the fortification of Fort Fisher, Robinson provides a significant amount of detail on the Union preparations for the siege of Fort Fisher, detailing the organization of troops and ships, the command of Rear Admiral David Porter and other important figures, and the decision to use a ship packed with gunpowder as a makeshift torpedo to damage the Fort’s defenses. “Hurricane of Fire” also provides in depth detail on the military strategy behind both the first and second battles of Fort Fisher, as well as the eventual capture of Fort Fisher and the Union occupation of Wilmington. 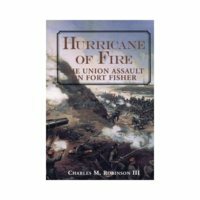 In “Hurricane of Fire,” Charles Robinson provides an excellent history of Fort Fisher as well as delving into the importance of the Fort in terms of both Union and Confederate strategies. By stressing the significance of the port at Wilmington as the most important of the Confederates few remaining lifelines, Robinson expresses the argument that the fall of Fort Fisher was a tremendous victory for the Union and a crushing defeat for the Confederacy, placing the last nail in the coffin of the South’s war effort. Robinson, Charles. Hurricane of Fire: The Union Assault on Fort Fisher. Annapolis, MD: Naval Institute Press, 1998. For four years, Fort Fisher was the Achilles' heel of the Union blockade. As long as it stood, Wilmington would remain open. The odds were overwhelmingly in favor of the blockade-runners that came and went virtually on schedule, openly defying the Federal fleet. In short, because of Fort Fisher, the blockade of Wilmington simply did not work, and it was an easy matter to transport incoming material to the front in Virginia. Although Federal naval authorities early in the war grasped the need to take Fort Fisher, their army counterparts did not. Their reasons, stated or otherwise, were numerous. One was an obsession with Charleston, South Carolina, a port of less strategic significance but far greater emotional interest. Because the war had started in Charleston, that city had become a fetish for the North, and in 1863 all resources for a coastal invasion were diverted in a wasteful and futile attempt to capture it. By the middle of 1864, however, Federal planners had come to realize that if the war were to end soon, Fisher would have to be taken. When the North finally moved against Fort Fisher and Wilmington, the Confederacy was crumbling. Most of the country was either occupied or isolated, and the Federal armies had the approaches to Richmond under siege. Modern historians, given the vantage of more than 130 years of hindsight, question whether an expedition against Fort Fisher at that point was even significant to the outcome of the war. But to those at the time, the question was not so simple. As long as Wilmington remained open, food coming through the blockade would reach Lee's beleaguered army, and that army could continue the war. Confederate leaders hoped a prolonged war would exhaust the North and bring about an armistice that would allow the South to maintain its independence. While their Northern counterparts did not doubt the outcome of the war, they dreaded its continuation and meant to conclude it as rapidly as possible. To do so, they had to deny food to the Confederate armies. This meant capturing Fort Fisher, closing Wilmington, and disrupting the blockade traffic. Charles M. Robinson III, Charles M. Robinson III, "Hurricane of Fire" (1998), Civil War Era NC, accessed April 24, 2019, https://cwnc.omeka.chass.ncsu.edu/items/show/338.